Tag line: "They're back -- in their mummy's arms!" After watching them take on three Universal monsters in Abbott and Costello Meet Frankenstein, I figured the next logical step was to follow the comedy duo to Egypt, where they're chased and tormented by an ancient mummy and a handful of very dangerous (and very mortal) adversaries. After overhearing Egyptian archaeologist Dr. Zoomer (Kurt Katch) discuss his latest find, the mummy of Klaris, with some reporters, Bud and Lou decide to offer their services by acting as bodyguards for the mummy’s upcoming trip to America. Little do they know that two other groups are also interested in the doctor’s most recent discovery, including the followers of Klaris, led by Semu (Richard Deacon), who have sworn to protect the mummy at all costs (according to legend, Klaris is the guardian of Princess Asa’s tomb, where untold riches still lie). At the same time, an ambitious businesswoman named Madame Rontru (Marie Windsor) wants to get her hands on the sacred medallion of Klaris, which supposedly reveals where the Princess and her treasure are buried. But when our bumbling heroes locate the medallion first, they find themselves running for their lives from both parties, as well as one very angry mummy. Released in 1955, Abbott and Costello Meet the Mummy proved to be the final movie the pair would make for Universal Studios, and, unfortunately, the two were showing their age. As it is with all of their outings, Lou Costello suffers the brunt of the abuse (in the opening scene, the boys visit the Café Bagdad, and as they sit quietly at their table, a female acrobat performing on-stage is tossed into Costello’s lap, causing his chair to shatter into a dozen pieces), yet his energy level is noticeably lower than it had been in previous films (which becomes apparent during a later scene, where he’s running through an underground chamber). 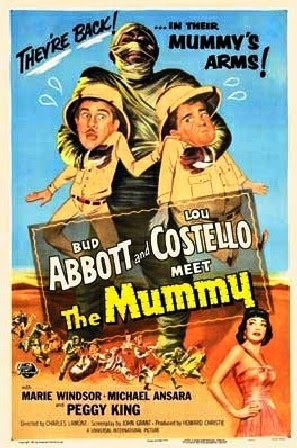 What’s more, the witty banter that made Abbott and Costello household names is sorely lacking (I liked the “mummy” discussion early on, when Costello is shocked to learn “some mummies can be men”, but an exchange involving a shovel and pick, designed to resemble their famous “Who’s on First” routine, falls flat well before it’s over). Still, like any Abbott and Costello outing, there are laughs to be found in Abbott and Costello Meet the Mummy; the sequence mentioned above, where Costello is running through the underground chamber, ends with him sliding about 10 feet across a polished marble floor, and an earlier scene, where he and Abbott are looking around Dr. Zoomer’s house, has its moments as well (the funniest of which involves a tape recorder). So, despite the fact the pair had lost a step, they still managed to turn their encounter with the mummy into a pretty good time.